When it comes time to replace your watch crystal, you can attach the new crystal in a couple different ways with adhesives. 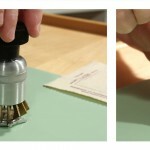 Use this guide to learn how to use GS Crystal Cement to bond the new crystal to your watch case. After you have cleaned the watch case and your new watch crystal is on hand, you need to test your GS cement applicator to understand how quickly the glue dispenses. 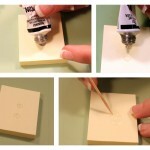 Squeeze the applicator over your notepad to test the rate at which the glue flows smoothly. When you are comfortable with the way the glue comes out of the applicator tip, move the tip to the ledge of the watch bezel where the crystal sits. Carefully apply a small and even amount of crystal cement to the bezel ledge. Take your watch crystal and carefully place it into the bezel over the ledge so that all the edges of the crystal are sitting in the cement on the watch case. 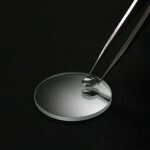 Press down softly on the watch crystal once it is place to ensure that the crystal sets perfectly into place. Let the glue set for ten minutes. Then, once the cement has hardened, take a toothpick or piece of pegwood and use it to remove the excess glue from the watch case. Gently use the toothpick to scratch any areas of excess glue off of the watch case and crystal. 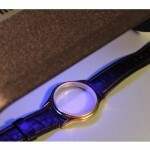 Be careful not to damage the watch crystal by applying excess pressure. 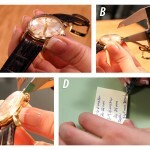 Once you have removed all excess glue, you can put the watch back together if necessary and continue to wear it again. To learn more about watch repair, or for more methods on attaching a watch crystal, check out Learning Center.